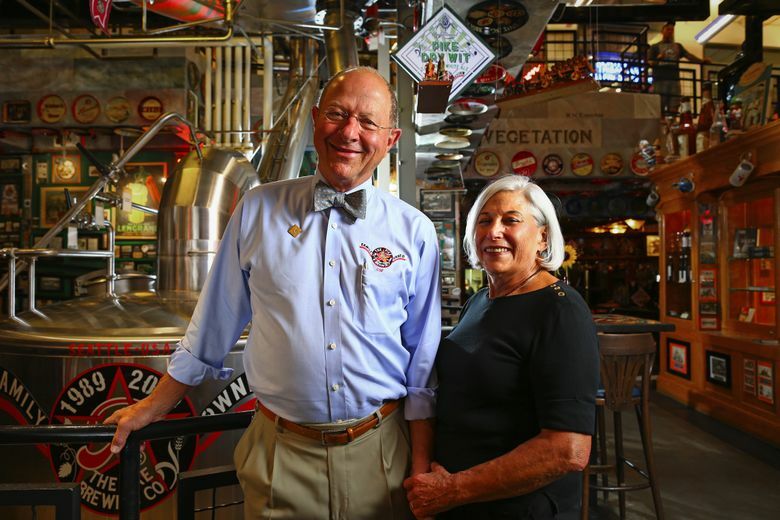 Charles and Rose Ann Finkel began as wine importers but switched to beer in 1978 and have been leaders of the craft brewing industry since. The museum’s crowded walls document highlights from those millennia: from the cultivation of grain in Mesopotamia; to the pubs and monasteries of the Middle Ages; to the 20th-century revival of craft brewing in America, a movement in which Finkel played a significant role. Finkel is a fast-talking, bow-tied encyclopedia of beer who hasn’t quite lost the broad vowels of his Oklahoma youth, even though he’s lived in Seattle since 1974. “Charles has a great memory for facts, but sometimes he can’t remember my name,” quips New Orleans-born Rose Ann Finkel, his business partner and wife of 47 years. “Malt, hops, yeast and water: that’s all you need to make beer. You can change the flavors by toasting the grain or using different kinds of hops,” says Charles. “You can’t believe how different strains of yeast can taste,” adds Rose Ann. They test-brewed five strains for their first beer, Pike Pale Ale. The one they use for most of their beers tastes a little nutty and goes well with food. They consider it so valuable they keep some of the mother yeast in a bank. The Finkels designed their brewing method to be gravity-driven. Daily tours of the three-story building allow folks to follow the whole process, from the grist case and mash tun on the top floor to the brew kettle below, in the center of the bustling Pike Pub. The brew house occupies the building’s lowest level, along with the bottling machine Charles refers to as “Rose Ann’s Ferrari, because it’s Italian, temperamental and expensive.” Nearby they park the pint-size BMW they use to scoot around town. It’s wrapped with a blown-up reproduction of the Pike Brewing label that Charles, a prolific graphic artist, created. Dubbed “The Art Director of Beer,” he has designed all of Pike’s labels as well as those for some of the world’s most celebrated beers. The Finkels began as wine importers but switched to beer in 1978. Their company, Merchant du Vin, primed the U.S. market for small-batch craft brews, long before Pike’s IPA, Pale Ale, Naughty Nellie, Kilt Lifter and Monk’s Uncle turned up on taproom handles. In those days, you couldn’t find a bottle of Samuel Smith or a Belgian Trappist Ale, just mainstream imports like Heineken, Foster’s or Beck’s. The Finkels imported beer from the finest, family-owned breweries in Europe and worked with beer-makers here to revive those classic brewing styles. Merchant du Vin changed the American beer scene, influencing a whole generation of craft brewers, noted Draft Magazine in 2007, naming Charles one of 10 innovators in beer. The Finkels haven’t stopped blazing trails. This year they introduced the first Washington State varietal beer. Called Pike Locale, it’s made with Yakima hops and Alba variety barley malt, the first release from Skagit Valley Malting, a new company that works closely with Washington State University’s Bread Lab. “Malt is the soul of beer,” says Charles. It’s made from grains that have been soaked, germinated and dried. Once, there were hundreds of malting companies in America. Those few that remain typically calibrate their malt to the needs of large commercial breweries. It’s a mass-produced product made in huge batches. Craft brewers work in very small batches. The Skagit Valley is one of the top growing regions in the world for the kind of low-protein barley that craft brewers crave. Farmers were already planting cereal grain as a cover crop, mostly to feed cattle. But craft brewers, distillers and bakers provide a market for higher quality grains and malt that can be produced in small volumes and tailored to the flavor requirements of each customer. Providence Cicero is The Seattle Times restaurant critic. Reach her at providencecicero@aol.com. John Lok is a Times staff photographer.